I have been in the mood for embroidery lately. It is fun, soothing, and makes for awesome gifts. 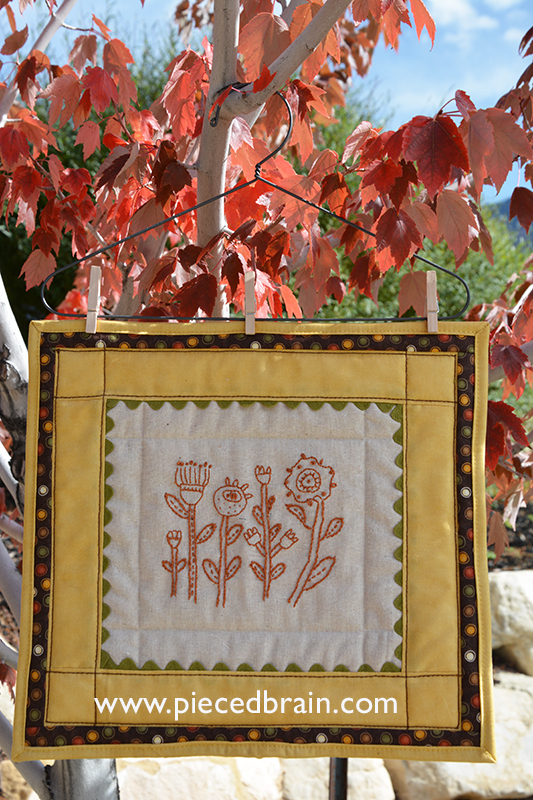 This is the little wall hanging I finished last weekend: it measures 12" x 13", with simple quilted lines, and a bit of fall colors to frame everything. 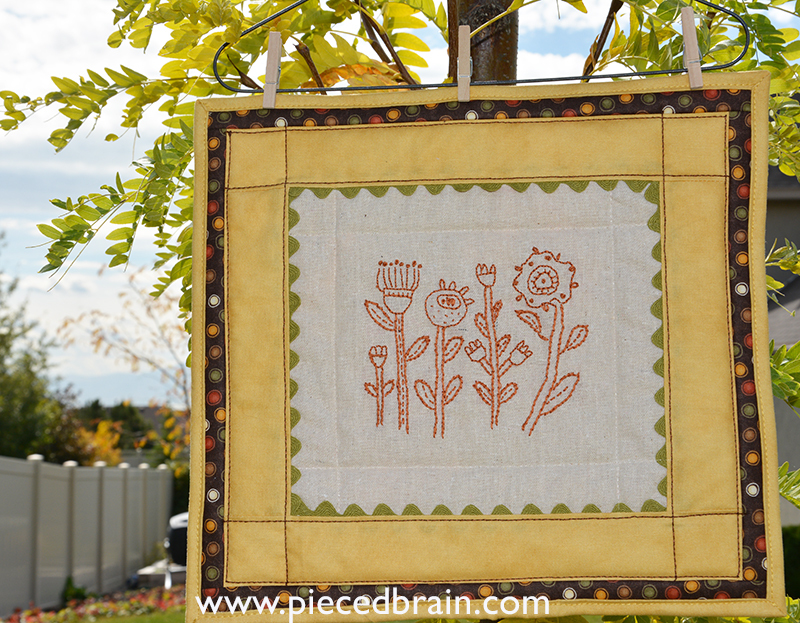 The green ric-rac adds whimsy and evokes the green of the flowers which I chose not to use on the embroidery. I wanted the center block to stand out and so I kept the borders (and quilting) simple. I used DMC thread for the embroidery, and Aurifil to piece and quilt the wall hanging: I managed to use 4 different Aurifil thread weights in one tiny project! My choice of Osnaburg fabric for the background came back to haunt me because its open fibers made the stitches sink - when I doubled the thread the stitches looked chunky. Ai, ai, ai. Overall, I think it turned out fine, though. I got the design from the book Stitches from the Garden by Kathy Schmitz. When I started going through its pages I was amazed at how dainty, how creative, and how easy-to-make the designs were. You can make them just as Kathy did or, like me, use her designs as inspiration for your own projects. These are magnetic needle keepers! We won't forget where we put them anymore! I have already transferred this and another design to tea towels, which are my next embroidery project. They will make great gifts! Martingale is giving away a copy of the Stitches from the Garden book (print for US and Canada residents, eVersion - which is the one I have - for blog followers outside the US) to one lucky winner! 3. Make sure I have a way to contact you (if you are a no-reply blogger, leave your emails as "soandso at myemail dot com" so you don't get spammed). I will announce the winner on Monday, October 17. I look forward to reading your comments. In the meantime, enjoy your day! I follow your blog in a reader (Old Reader)--that way I don't miss any posts :). Thanks very much. I love Kathy's designs and have made a couple of her quilt patterns. I like that she has lots of birds and flowers--this book looks wonderful! In the beginning I like to add french knots and other stitches to art quilts for visual texture. Now I am also enjoying stitching up some small motifs for all things gifty. Thanks fot the opportunity to win. I like all embroidery designs. My favourite seem to be a combination of words and simple nature designs. This book looks right up my alley! I like simple designs the best with nature motifs. This looks like a perfect book! I like cute embroidery with a fusion of vintage & contemporary. This looks like an awesome book, Denise! I enjoy embroidering flowers, phrases and dainty pieces. Then I can make them into small pillows or frame them for gifts. I get your blog in my emails. I love whimsical embroidery and nature scenes. My favorite recent piece I did was a seasons tree. This book will be on my Christmas list. Unless I win it , of course:). My favorites are the flower designs. I follow your blog from my e mail. I like redwork embroidery. The bird and nest on the cover of this book appeals to me. Your embroidery project looks great! Thanks for the giveaway. I have been taking an embroidery class this year. My main objective was to learn how to do ribbon embroidery, which is my favorite, but I have found I really like all aspects of it and I'm currently making a crazy quilt bed runner. Thanks for the great giveaway. I follow you via email. I love to sit down with my coffee in the morning and see what everyone is working on today. I don't embroider, but, if I was the lucky winner...I would give it to a friend. Thank you! I haven't done embroidery since I was a child but I would enjoy patterns with outlines like the ones above. Thanks for offering the book. It looks beautiful! I follow your blog on feedly and I also receive your emails. Thank you for letting us know about this beautiful book. I love floral designs. Your project turned out beautifully. I like the ric rac border too. Those designs are great. I love the magnets. I love Kathy Schmitz! I have done a couple of her designs. The use of thread and colored pencil and fabric is so beautiful! With a touch of primitive I adore! I love floral and garden embroidery designs - and this new book looks fabulous! My current embroidery project is a Halloween motif stitched with No. 12 perle cotton on a tea towel. Love to have a hand stitching project available for cheering on my baseball team. clara-chandlerdotattdotnet. Thanks for a chance in the giveaway. Kathy has long been a designer I love. I usually like whatever is in season. Right now I'm working on witches and Halloween but will be doing Christmas before the month is out. The more whimsical it is the better I like it. I have just recently started embroidery and I am just loving it. 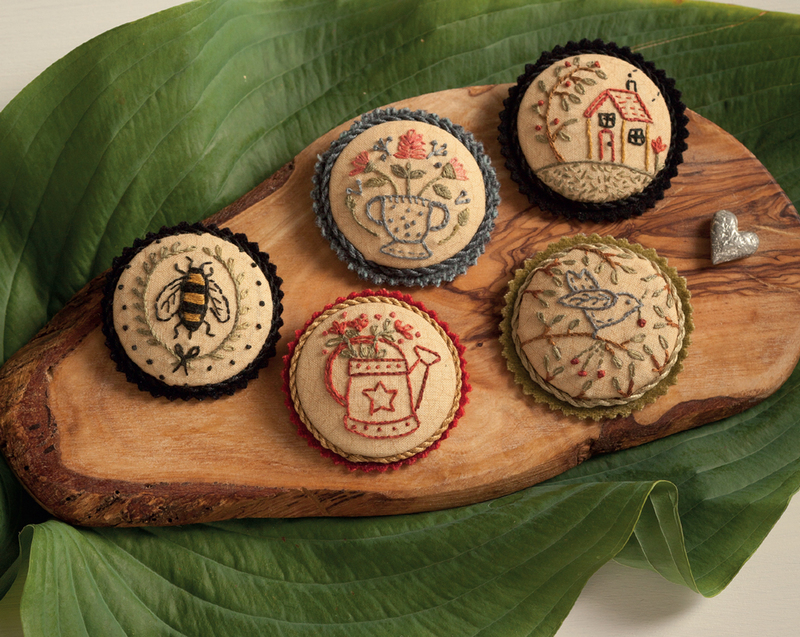 I like the look of vintage embroidery made into a modern piece like your little wall hanging. This book looks perfect. I like small embroidery with just a few colors. the books looks lovely. I like all types of embroidery designs. I do love red work though. I love redwork embroidery but have tried all kinds. I am pretty new to embroidery, so I hope to learn a lot from this book. All the designs I see are amazing! I receive you posts by email. I love embroidery! Thanks for the chance to win! I follow through email and Bloglovin. I have been sewing and embroidering since I was 4 years old and I have been doing both for 63 years because I love it. At the moment I am enjoying redwork designs by Gail Pan and those from Red Brolly especially the Christmas projects. I follow you by email newsletter and on Bloglovin'. I was taught embroidery when I was 8, Now 50 years later,,, I am picking it all back up! I am collecting things and will start teaching my grand daughters how to embroider this winter. I enjoy the "days of the weeks" things...like on towels or aprons. That is what I hope to find to teach my GD's. I do love embroidery! I have several projects that have both embroidery and piecing.I love doing both. I like simple embroidery that looks more difficult than it is. I really like what might be classified as country or rustic. Thanks for the giveaway. BTW - When I clicked the link in my email - I was taken to a giveaway from January. I didn't check the date and thought it was weird that it wasn't for embroidery. So, after I entered that long ago giveaway, I clicked on your home page and found the correct giveaway. I follow via Bloglovin' and email. I like small designs. Like to make pincushions as gifts. I am following you on email. I like the combination of embroidery and patchwork design. Thanks for the chance to win. I love flower designs the most! thank you!! The red work on a tra towel is the perfect gift!! I love that!!! 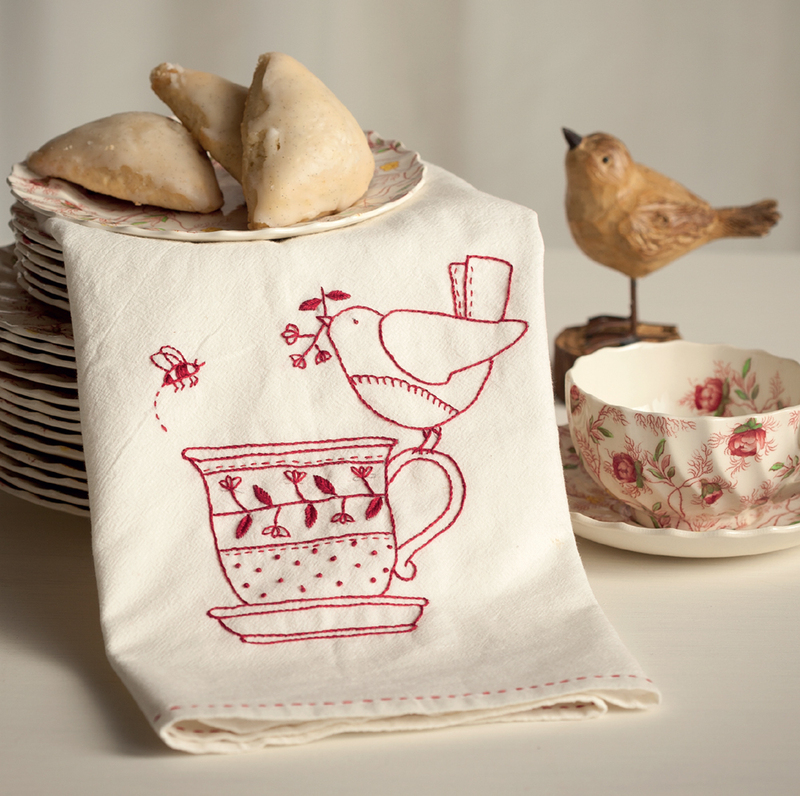 I love the type embroidery that's on the little towel with teacup and birdie. I love the embroidery on the pillow and on the tea towel. I actually have blocks embroidered for a red work quilt. I added you on Google+, thanks! Anything that catches my eye, I guess, Kathy Schmitz, Red Brolly, modern, inspirational phrases, animals, sci-fi/geek stuff. Lol Urban Threads designs are great too! Puxa vida! !A quanto tempo não recebo suas atualizações,agora abro caixa de E-mail e ei-la!! !Que saudade!BeijoGRANNNNNNNNNNDE!!! I love bird, flower and animal embroidery. Lately I have just been doing snowmen but I love birds and flowers. Tea towels and pillow cases would be fun again. I follow this sit with my Google dashboard. I like the simpler floral designs best and usually smaller ones, such as the redwork you did or the needle keepers. That way I can finish more quickly. I follow you via email. Thanks for the give-away! Your designs are beautiful! I love nature designs: leaves, trees, flowers. Very pretty book - thanks for the chance to win. 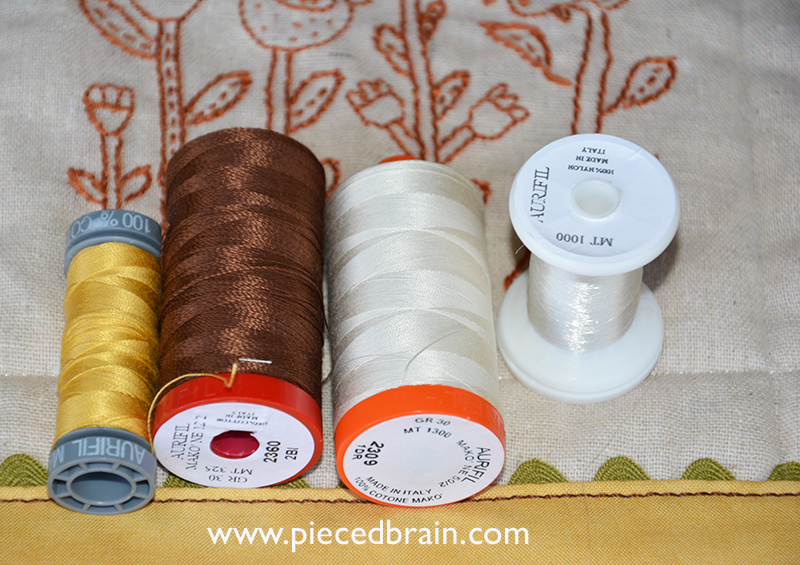 I enjoy doing stitcheries with thicker threads, such as No 5, and also candlewick projects. This book looks amazing. 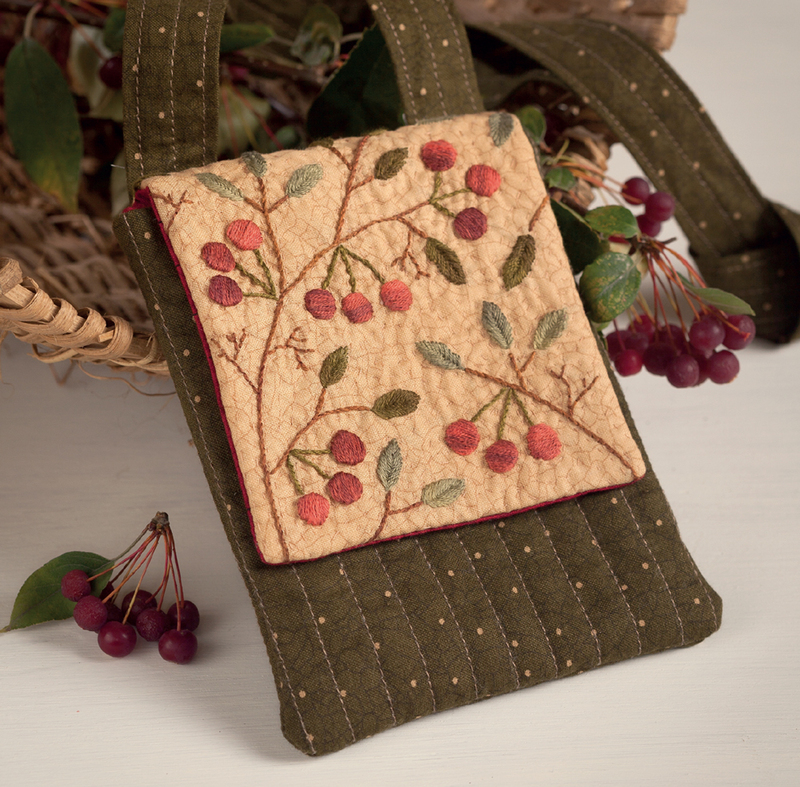 I love embroidery designs that can be kept out all year long. Like with nature and inspirational words, and that can be used in different types of projects. Thanks for the giveaway!! I really like a variety of patterns from retro designs, holidays, nature, animals. It is all fun. I like floral designs and geometric designs. I am new to your blog. Would like to follow you. I like pretty much all kinds of embroidery. I especially enjoy patterns which include many different stitches.